As the world of marketing gets more and more cluttered every day, it's forcing advertisers to get creative. In marketing, the term 'ambient' means placing the ads at unusual places or unconventional places where you wouldn't expect an advertisement. The idea behind ambient advertising is to surprise consumers with its placement at unusual, unexpected or wacky ad spaces. 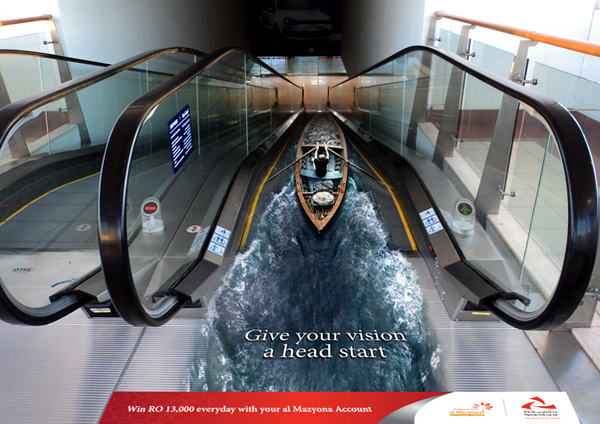 "The first thing that will catch your eye when you are looking at an ambient advertisement would be its unusual location. The second characteristics of such an advertising is the fact that there is no repetition. Another thing which is important is the execution. How well the ad is being executed, or does it really creating an impact that was required for effective communication. Does it really have a wow factor? All these things are taken into consideration while designing an ambient advertising campaign" (The Economic Times). "Ambient advertising can be found anywhere and everywhere! The key to a successful ambient media campaign is to choose the best media format available and combined with effective message. These kinds of ads often make someone think about a certain place or thing differently", Ryan Lum. Creative Guerrilla Marketing, 2012). In 2016, Audi arrives at the New York Auto Show with the message that its A4 has overtaken the BMW 328i in many areas, such as power, acceleration, and technologies, such as lane assistance and CarPlay. With a target audience of one million people attending the event, Audi wanted a surprising way to reach potential car buyers and advertising agency Muhtayzik Hoffer (now M/H VCCP) had an unexpected idea. Audi set up a bunch of free Wi-Fi networks -Wi-Fi is often difficult to find in convention centers and is usually password protected-, so when people went to their smartphone settings to log onto the Wi-Fi, they saw that the auto show Wi-Fi was named "328 Reasons to choose A4". The other network names changed as the show goes on but there were always at least 10 networks on at a time. 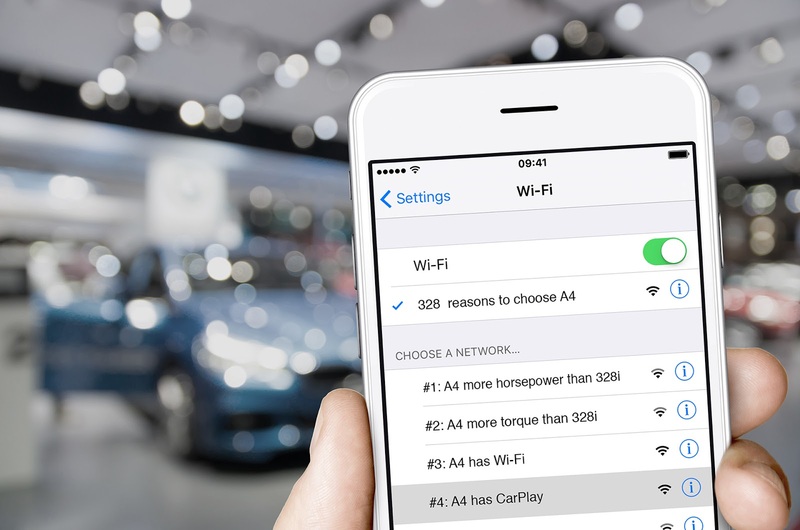 Every time car shoppers logged on to the car show Wi-Fi, they were given yet another reason to buy an Audi A4. And over the course of the three-day event, they saw 328 reasons in total. The next example is a campaign by Abby Norm, Sweden for . If you want to watch know more about Ambient Advertising I highly recommend you listen to the last episode of Under the Influence by Terry O'Reilly.